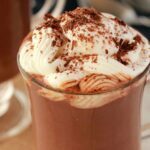 Rich and delicious vegan hot chocolate – warm, comforting and satisfying this is more than a drink, this is dessert in a mug! Perfect for cold nights, when there’s a nip in the air, or even if there’s just a bit of a breeze outside! Add the soy or almond milk and cocoa powder to a saucepan and heat, whisking to combine the cocoa with the milk, and heat until simmering. Remove from heat and add in the vegan chocolate or chocolate chips. Let it sit for a minute and then whisk in until smooth. Pour out into two mugs. Add brown sugar to taste. Top with vegan whipped cream and chocolate shavings. *I prefer soy milk for this as it’s thicker/richer, but almond milk also works great. *I used 2 Tbsp Brown Sugar (1 Tbsp per serve) but this does make it a very sweet drink, so use according to taste. *Nutritional information includes 2 Tbsp of brown sugar but excludes additional toppings like vegan whipped cream and chocolate shavings.